Emergency personnel respond to Newcomb Hollow Beach in Wellfleet, Mass, on Saturday, Sept. 15, 2018. 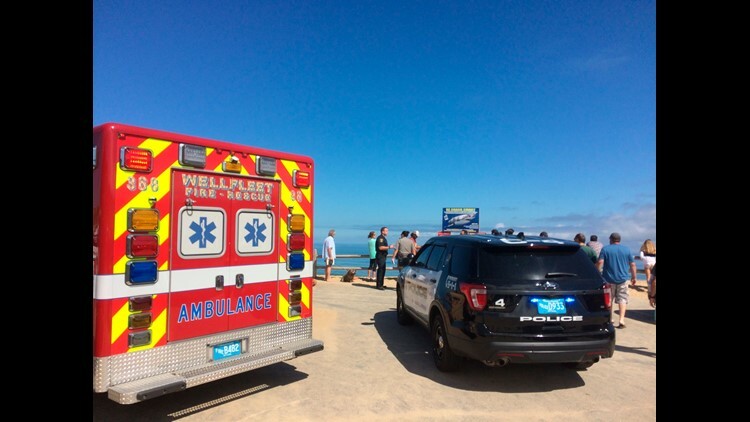 A man died at a Cape Cod hospital Saturday after police say they believe he was attacked by a shark off a Wellfleet, Massachusetts, beach. The victim was identified as a man in his mid-20s by police. The attack happened at Newcomb Hollow Beach around noon Saturday, according to a release. The incident would be the first fatal shark attack in the state since 1936. In August, a 61-year-old man swimming in Cape Cod was bitten by a shark and suffered "deep puncture wounds,” according to officials. The beach is popular with surfers and was busy Saturday, according to beachgoers. There were no lifeguards on watch as the summer season is over. Local fisherman Joe Booth said he saw the victim, who was boogie boarding with a friend, aggressively kick something behind him. Booth said he saw a flicker of a tail from the water. Booth said some people on the beach attempted to make a tourniquet while others frantically called 911. The Wellfleet Police Department says it is working with the National Park Service and State Police to investigate the incident. The beach has been closed to swimming.